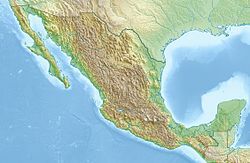 The 1887 Sonora earthquake occurred at 22:13 UCT on 3 May in the Teras mountain range of northwestern Mexico. It was widely felt, with some damage being recorded up to 200 kilometres (120 mi) from the epicenter in both Mexico and the United States. The earthquake had an estimated magnitude of 7.6 and caused 42 casualties in the town of Bavispe and 51 overall. It was the only historical earthquake to cause considerable damage in Arizona. The 1887 Tombstone Arizona newspapers mentioned lesser quakes (aftershocks) on August 27, 1887, and November 11, 1887. ^ Suter, M.; Contreras J. (2002). "Active Tectonics of Northeastern Sonora, Mexico (Southern Basin and Range Province) and the 3 May 1887 Mw 7.4 Earthquake". Bulletin of the Seismological Society of America. 92 (2): 581–589. Bibcode: 2002BuSSA..92..581S. doi: 10.1785/0120000220. Retrieved 11 August 2010. ^ Suter, M. (2006). "Contemporary Studies of the 3 May 1887 Mw 7.5 Sonora, Mexico (Basin and Range Province) Earthquake". Seismological Research Letters. 77 (2): 134–147. doi: 10.1785/gssrl.77.2.134. Retrieved 11 August 2010. ^ Castro, R.R. ; Shearer P.M.; Astiz L.; Suter M; Jacques-Ayala & Vernon F. (2010). "The Long-Lasting Aftershock Series of the 3 May 1887 Mw 7.5 Sonora Earthquake in the Mexican Basin and Range Province" (PDF). Bulletin of the Seismological Society of America. 100 (3): 1153–1164. Bibcode: 2010BuSSA.100.1153C. doi: 10.1785/0120090180. Retrieved 5 May 2011. ^ a b Suter, Max (March–April 2006). "Contemporary Studies of the May 1887 M 7.5 Sonora, Mexico (Basin and Range Province) Earthquake". Seismological Research Letters. Instituto de Geologia, Universidad Autonoma de Mexico. 77 (2): 134–147. doi: 10.1785/gssrl.77.2.134. ^ Michels, John (6 April 1888). "The Sonora Earthquake". Science. 11 (270): 162–167. Bibcode: 1888Sci....11..162.. doi: 10.1126/science.ns-11.270.162. PMID 17790119. Retrieved 16 March 2013. ^ Goodfellow, G. E. (12 August 1887). "The Sonora Earthquake". Science. 10 (235): 81–82. Bibcode: 1887Sci....10...81G. doi: 10.1126/science.ns-10.236.81. ^ a b Michels, John (6 April 1888). "Volume 11". Science. 11 (270): 169. Bibcode: 1888Sci....11..169C. doi: 10.1126/science.ns-11.270.169. Retrieved 16 March 2013.